The sweet potato sandwich at Simple Things is a pretzel roll holding grilled sweet potato, apples, jammy onions, chevre spread, avocado and cumin coleslaw. That’s a bit of an odd lineup, to my eyes, and I was curious to see if it would work. There’s nothing specifically jarring about it, it just seems a bit jumbled. The apples and the chevre fit well together, but they don’t exactly match the avocado. The avocado seems like it would go well with the cumin coleslaw, but then where does the chevre fit? It’s almost two sandwiches in one. But enough about concept, sandwiches ultimately matter only in execution. With that in mind, this is a significantly smoother sandwich than it is on paper, but it’s far from perfect. The dominant notes in the flavor profile are the sweet potatoes, the cumin cole slaw, the avocados and the pretzel roll. That’s too bad about the roll, because it’s the breading that ultimately hamstrings the sandwich. 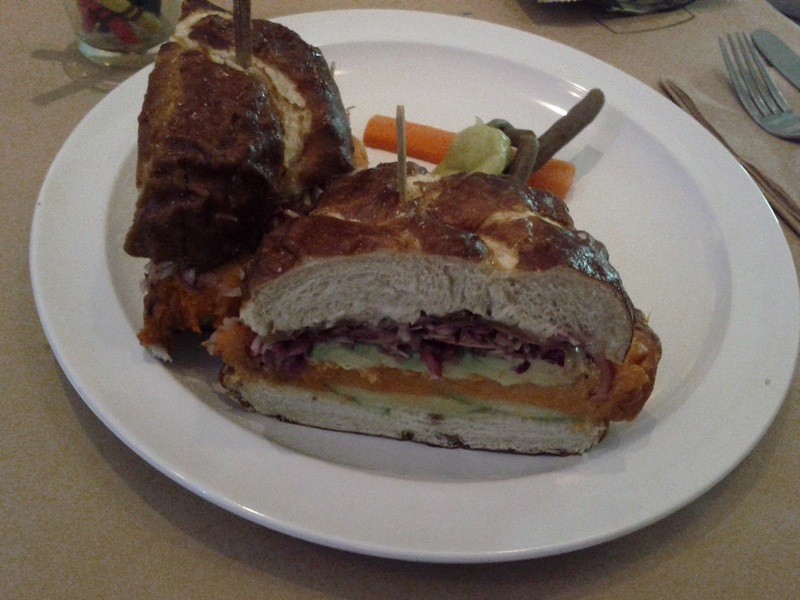 With a fairly tough crust, the pretzel roll gave this sandwich an unacceptable level of filling creep, with large chunks of sweet potato diving from the sandwich to the plate. Sliced bread would have been my play here, something soft and yielding. So what we’re left with is another strong example of the complexity of sandwiches. There are hazards in concept and even more in execution, and it takes a skilled hand to navigate them all and arrive at a truly excellent sandwich. This entry was posted in Sandwich Reviews and tagged Los Angeles, Reviews by Pete, Sandwiches I Have Eaten, Simple Things, Vegetarian by Pete. Bookmark the permalink. I never even look at the other sandwiches on the menu there, I love their fried chicken sandwich so dearly. Wait, I take that back. They also make a good Thanksgiving sandwich.